Apr. 16, 2013 — According to a recent study, the popularly elected members of the German Bundestag are substantially more risk-tolerant than the broader population of Germany. Researchers in the Cluster of Excellence “Languages of Emotion” at Freie Universität Berlin and at DIW Berlin (German Institute for Economic Research) conducted a survey of Bundestag representatives and analyzed data on the general population from the German Socio-Economic Panel Study (SOEP). Results show that risk tolerance is even higher among Bundestag representatives than among self-employed people, who are themselves more risk-tolerant than salaried employees or civil servants. This was true for all areas of risk that were surveyed in the study: automobile driving, financial investments, sports and leisure activities, career, and health. The authors interpret this finding as positive. The full results of the study were published in German in the SOEPpapers series of the German Institute for Economic Research (DIW Berlin). The authors of the study, Moritz Hess (University of Mannheim), Prof. Dr. Christian von Scheve (Freie Universität Berlin and DIW Berlin), Prof. Dr. Jürgen Schupp (DIW Berlin and Freie Universität Berlin), and Prof. Dr. Gert G. Wagner (DIW Berlin and Technische Universität Berlin) view the above-average risk tolerance found among Bundestag representatives as positive. According to sociologist and lead author of the study Moritz Hess: “Otherwise, important societal decisions often wouldn’t be made due to the almost incalculable risks involved. This would lead to stagnation and social standstill.” The authors do not interpret the higher risk-tolerance found among politicians as a threat to democracy. “The results show a successful and sensible division of labor among citizens, voters, and politicians,” says economist Gert G. Wagner. Democratic structures and parliamentary processes, he argues, act as a brake on the individual risk propensity of elected representatives and politicians. For their study, the research team distributed written questionnaires to all 620 members of the 17th German Bundestag in late 2011. Twenty-eight percent of Bundestag members responded. Comparisons with the statistical characteristics of all current Bundestag representatives showed that the respondents comprise a representative sample of Bundestag members. SOEP data were used to obtain a figure for the risk tolerance of the general population for comparison with the figures for Bundestag members. The questions posed to Bundestag members were formulated analogously to the questions in the standard SOEP questionnaire. Politicians were asked to rate their own risk tolerance on a scale from zero (= not at all risk-tolerant) to ten (= very risk-tolerant). They rated both their general risk tolerance as well as their specific risk tolerance in the areas of driving, making financial investments, sports and leisure activities, career, health, and trust towards strangers. They also rated their risk tolerance in regard to political decisions. No questions on party affiliation were asked in order to exclude the possibility that results could be used for partisan political purposes. Hess, M., von Scheve, C., Schupp, J., Wagner. G. G. (2013): Members of German Federal Parliament More Risk-Loving Than General Population, in: DIW Economic Bulletin, Vol. 3, No. 4, 2013, pp. 20-24. Hess, M., von Scheve, C., Schupp, J., Wagner. G. G. (2013): Sind Politiker risikofreudiger als das Volk? Eine empirische Studie zu Mitgliedern des Deutschen Bundestags, SOEPpaper No. 545, DIW Berlin. The public is increasingly uncomfortable with both the processes and the results of government and industry decision-making about chemical hazards. Decisions that expose people to uncertain and potentially catastrophic risks from chemicals seem to be made without adequate scientific information and without an appreciation of what makes a risk acceptable to the public. The history of environmental and occupational health provides myriad examples in which entire industries have acted in complete disregard of public health risks and in which government failed to act until well after disasters were apparent. It is not necessary to name each chemical, each debacle, in which the public was once told the risks were insignificant, but these include DDT, asbestos, Kepone, tobacco smoke, dioxin, PCBs, vinyl chloride, flame retardants in children`s sleepware, Chlordane, Alar and urea formaldehyde foam. These chemicals were banned or severely restricted, and virutally no chemical has been found to be safer than originally claimed by industry and government. It is no wonder that government and industry efforts to characterize so many uncertain risks as “insignificant“ are met with great skepticism. In a pluralistic, democratic society, acceptance of uncertainty is a complex matter that requires far more than statistical models. Depending upon cultural and ethical factors, some risks are simply more acceptable than others. When it comes to chemical risks to human health, many factors combine to place a relatively higher burden on government and industry to show social benefits. Not the least of these is the unsatisfactory track record of industry and its regulatory agencies. Equally important are the tremendous gaps in scientific knowledge about chemically induced health effects, as well as the specific characteristics of these risks. Chemical risks differ from many other kinds because, not only are the victims struck largely at random, but there is usually no way to know which illnesses are eventually caused by a chemical. There are so many poorly understood illnesses and so many chemical exposures which take many years to develop that most chemical victims will not even be identified, let alone properly compensated. To the public, this difference is significant, but to industry it poses few problems. Rather, it presents the opportunity to create risks and yet remain free of liability for the bulk of the costs imposed on society, except in the rare instance where a chemical produces a disease which does not otherwise appear in humans. Statutes of limitations, corporate litigiousness, inability or unwillingness of physicians to testify on causation and the sheer passage of time pose major obstacles to chemical victims attempting to receive compensation. The delayed effects of chemical exposures also make it impossible to fully document the risks until decades after the Pandora`s box has been opened. The public is increasingly afraid that regulators are using the lack of immediately identified victims as evidence of chemical safety, which it simply is not. Chemical risks are different because they strike people who have given no consent, who may be completely unaware of danger and who may not even have been born at the time of the decision that led to their exposure. They are unusual, too, because we don`t know enough about the causes of cancer, birth defects and neurological and immunologic disorders to understand the real risks posed by most chemicals. The National Academy of Sciences has found that most chemicals in commerce have not even been tested for many of these potential health effects. In fact, there are growing concerns of new neurologic and chemical sensitivity disorders of which almost nothing is known. We are exposed to so many chemicals that there is literally no way of estimating the cumulative risks. Many chemicals also present synergistic effects in which exposure to two or more substances produces risks many times greater than the simple sum of the risks. Society has begun to see that the thousands of acceptable risks could add up to one unacceptable generic chemical danger. The major justification for chemical risks, given all of the unknowns and uncertainties, is an overriding benefit to society. One might justify taking a one-in-a-million risk for a product that would make the nation more economically competitive or prevent many serious cases of illness. But such a risk may not be acceptable if it is to make plastic seats last a little longer, to make laundry 5 percent brighter or lawns a bit greener, or to allow apples to ripen more uniformly. These are some of the reasons the public is unwilling to accept many of the risks being forced upon it by government and industry. There is no “mass hysteria“ or “chemophobia.“ There is growing awareness of the preciousness of human life, the banal nature of much of what industry is producing and the gross inadequacy of efforts to protect the public from long-term chemical hazards. If the public is to regain confidence in the risk management process, industry and government must open up their own decision-making to public inquiry and input. The specific hazards and benefits of any chemical product or byproduct should be explained in plain language. Uncertainties that cannot be quantified must also be explained and given full consideration. And the process must include ethical and moral considerations such as those addressed above. These are issues to be decided by the public, not bureaucrats or corporate interests. For industry and government to regain public support, they must stop blaming “ignorance“ and overzealous public interest groups for the concern of the publc and the media. Rather, they should begin by better appreciating the tremendous responsibility they bear to our current and future generations, and by paying more attention to the real bottom line in our democracy: the honest, rational concerns of the average American taxpayer. ScienceDaily (Nov. 15, 2012) — Several potentially preventable disasters have occurred during the past decade, including the recent outbreak of rare fungal meningitis linked to steroid shots given to 13,000 patients to relieve back pain. Before that, the 9/11 terrorist attacks in 2001, the Space Shuttle Columbia explosion in 2003, the financial crisis that started in 2008, the Deepwater Horizon accident in the Gulf of Mexico in 2011, and the Fukushima tsunami and ensuing nuclear accident also in 2011 were among rare and unexpected disasters that were considered extremely unlikely or even unthinkable. A Stanford University engineer and risk management expert has analyzed the phenomenon of government and industry waiting for rare catastrophes to happen before taking risk management steps. She concluded that a different approach to these events would go far towards anticipating them, preventing them or limiting the losses. To examine the risk management failures discernible in several major catastrophes, the research draws upon the combination of systems analysis and probability as used, for example, in engineering risk analysis. When relevant statistics are not available, it discusses the powerful alternative of systemic risk analysis to try to anticipate and manage the risks of highly uncertain, rare events. The paper by Stanford University researcher Professor Elisabeth Paté-Cornell recommends “a systematic risk analysis anchored in history and fundamental knowledge” as opposed to both industry and regulators sometimes waiting until after a disaster occurs to take safety measures as was the case, for example, of the Deepwater Horizon accident in 2011. Her paper, “On ‘Black Swans’ and ‘Perfect Storms’: Risk Analysis and Management When Statistics Are Not Enough,” appears in the November 2012 issue of Risk Analysis, published by the Society for Risk Analysis. Paté-Cornell’s paper draws upon two commonly cited images representing different types of uncertainty — “black swans” and “perfect storms” — that are used both to describe extremely unlikely but high-consequence events and often to justify inaction until after the fact. The uncertainty in “perfect storms” derives mainly from the randomness of rare but known events occurring together. The uncertainty in “black swans” stems from the limits of fundamental understanding of a phenomenon, including in extreme cases, a complete lack of knowledge about its very existence. Given these two extreme types of uncertainties, Paté-Cornell asks what has been learned about rare events in engineering risk analysis that can be incorporated in other fields such as finance or medicine. She notes that risk management often requires “an in-depth analysis of the system, its functions, and the probabilities of its failure modes.” The discipline confronts uncertainties by systematic identification of failure “scenarios,” including rare ones, using “reasoned imagination,” signals (new intelligence information, medical alerts, near-misses and accident precursors) and a set of analytical tools to assess the chances of events that have not happened yet. A main emphasis of systemic risk analysis is on dependencies (of failures, human errors, etc.) and on the role of external factors, such as earthquakes and tsunamis that become common causes of failure. The “risk of no risk analysis” is illustrated by the case of the 14 meter Fukushima tsunami resulting from a magnitude 9 earthquake. Historical records showed that large tsunamis had occurred at least twice before in the same area. The first time was the Sanriku earthquake in the year 869, which was estimated at magnitude 8.6 with a tsunami that penetrated 4 kilometers inland. The second was the Sanriku earthquake of 1611, estimated at magnitude 8.1 that caused a tsunami with an estimated maximum wave height of about 20 meters. Yet, those previous events were not factored into the design of the Fukushima Dai-ichi nuclear reactor, which was built for a maximum wave height of 5.7 meters, simply based on the tidal wave caused in that area by the 1960 earthquake in Chile. Similar failures to capture historical data and various “signals” occurred in the cases of the 9/11 attacks, the Columbia Space Shuttle explosion and other examples analyzed in the paper. The risks of truly unimaginable events that have never been seen before (such as the AIDS epidemics) cannot be assessed a priori, but careful and systematic monitoring, signals observation and a concerted response are keys to limiting the losses. Other rare events that place heavy pressure on human or technical systems are the result of convergences of known events (“perfect storms”) that can and should be anticipated. Their probabilities can be assessed using a set of analytical tools that capture dependencies and dynamics in scenario analysis. Given the results of such models, there should be no excuse for failing to take measures against rare but predictable events that have damaging consequences, and to react to signals, even imperfect ones, that something new may be unfolding. JC e-mail 4577, de 05 de Setembro de 2012. Banco nórdico é o mais seguro do mundo, construído para resistir a catástrofes climáticas e a explosão nuclear. A Embrapa envia esta semana 264 amostras representativas de sementes de milho e 541 de arroz para o Banco Global de Sementes de Svalbard, na Noruega, como parte do acordo assinado com o Real Ministério de Agricultura e Alimentação do país em 2008. Serão enviadas ao banco genético norueguês as coleções nucleares de arroz e milho, ou seja, um grupo limitado de acessos derivados de uma coleção vegetal, escolhido para representar a variabilidade genética da coleção inteira. Tradicionalmente, as coleções nucleares são estabelecidas com tamanho em torno de 10% dos acessos de toda a coleção original e incluem aproximadamente 70% no acervo genético. A escolha dessas culturas atende a uma das recomendações do Banco de Svalbard quanto à relevância para a segurança alimentar e agricultura sustentável. Embora não sejam culturas originárias do Brasil, são cultivadas no país há séculos e têm características de rusticidade e adaptabilidade às condições nacionais. A próxima cultura agrícola a ser encaminhada para o banco norueguês será o feijão, o que deve acontecer até o fim de 2012. O envio de amostras para Svalbard é mais uma garantia de segurança, já que o banco nórdico é o mais seguro do mundo, construído com total segurança para resistir a catástrofes climáticas e até a uma explosão nuclear. O banco tem capacidade para quatro milhões e quinhentas mil amostras de sementes. O conjunto arquitetônico conta com três câmaras de segurança máxima situadas ao final de um túnel de 125 metros dentro de uma montanha em uma pequena ilha do arquipélago de Svalbard situado no paralelo 780 N, próximo do Pólo Norte. ScienceDaily (Aug. 1, 2012) — Some young people’s expectations that they will not live long, healthy lives may actually foreshadow such outcomes. New research published August 1 in the open access journal PLOS ONEreports that, for American teens, the expectation of death before the age of 35 predicted increased risk behaviors including substance abuse and suicide attempts later in life and a doubling to tripling of mortality rates in young adulthood. The researchers, led by Quynh Nguyen of Northeastern University in Boston, found that one in seven participants in grades 7 to 12 reported perceiving a 50-50 chance or less of surviving to age 35. Upon follow-up interviews over a decade later, the researchers found that low expectations of longevity at young ages predicted increased suicide attempts and suicidal thoughts as well as heavy drinking, smoking, and use of illicit substances later in life relative to their peers who were almost certain they would live to age 35. “The association between early survival expectations and detrimental outcomes suggests that monitoring survival expectations may be useful for identifying at-risk youth,” the authors state. The study compared data collected from 19,000 adolescents in 1994-1995 to follow-up data collected from the same respondents 13-14 years later. The cohort was part of the National Longitudinal Study of Adolescent Health (Add Health), conducted by the Carolina Population Center and funded by the National Institutes of Health and 23 other federal agencies and foundations. A top economist at the International Monetary Fund has poured scorn on its “tainted” leadership and said he is “ashamed” to have worked there. He writes of “incompetence”, “failings” and “disastrous” appointments for the IMF’s managing director, stretching back 10 years. Mr Doyle, former adviser to the IMF’s European Department, which is running the bailout programs for Greece, Portugal and Ireland, said the Fund’s delay in warning about the urgency of the global financial crisis was a failure of the “first order”. In the letter, dated 18 June and obtained by the US broadcaster CNN, Mr Doyle said the failings of IMF surveillance of the financial crisis “are, if anything, becoming more deeply entrenched”. He writes: “This fact is most clear in regard to appointments for managing director which, over the past decade, have all-too-evidently been disastrous. Mr Doyle is thought to be echoing here widespread criticism that the head of the IMF is always a European, while the World Bank chief is always a US appointee. The IMF could not be reached immediately by the BBC. 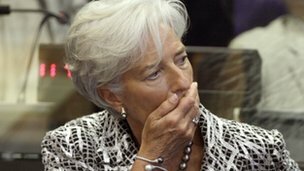 However, CNN reported that a Fund spokesman told it that there was nothing to substantiate Mr Doyle’s claims and that the IMF had held its own investigations into surveillance of the financial crisis. Peter Doyle’s letter is short but the criticism excoriating. Perhaps the bigger of the two main charges is that the IMF failed to warn enough about the problems that led to the global financial crises. The IMF has had investigations which have, up to a point, made similar criticisms, but not in such inflammatory terms. The IMF did issue some warnings, but the allegation that they were not sustained or timely enough and were actively suppressed raises some very big questions about the IMF’s role. Then there is the description of the managing director as tainted. It’s not personal. It’s a familiar attack on a process which always selects a European. It’s still striking, though, to hear it from someone so recently on the inside.